I have just upgraded to Audio Label 5 and installed it. On running the software my desktop has become pixillated and the screen is also pixillated. I am running an I 7 ASUS board - 64 bit and Windows 7. We're looking into this now. 1. When you start AudioLabel, is the view inside AudioLabel pixelated, or is only the desktop pixelated? 2. Do you know the model of your graphics card and the driver version? Based on what you described, it sounds like the Windows Compatibility mode for AudioLabel is set to run in 256 colors. To check this, please right click the AudioLabel icon on your desktop. Click 'Properties'. 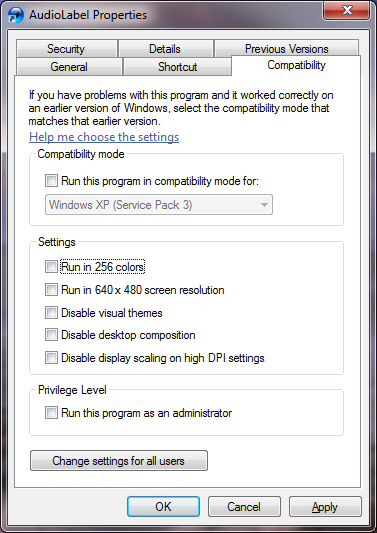 From the Properties dialog, select the 'Compatibility' tab. As shown in the following screen shot, no settings should be checked. Please make sure the Run in 256 colors is not checked. Please let us know if this corrects the problem.